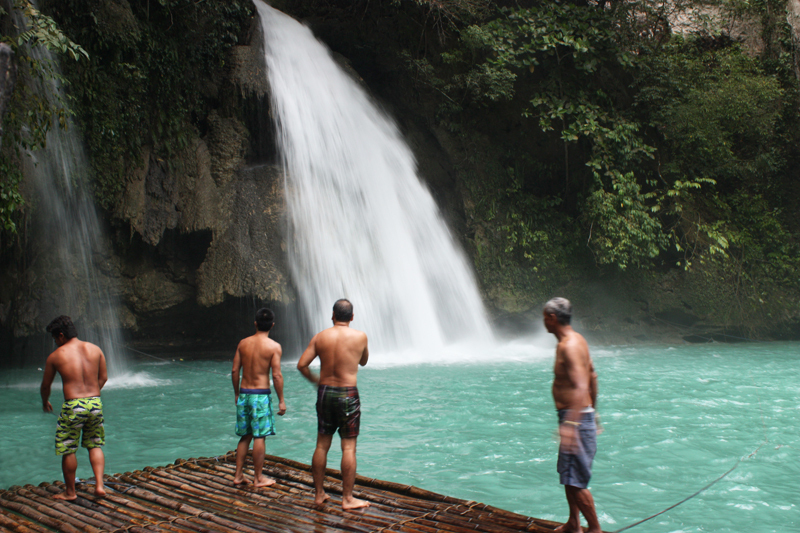 We reached Kawasan Falls after approximately 1 to 1.5 hour from Oslob (fare: P73) , where we had a great time swimming with the whale sharks earlier that morning. To get there, we had to ride an ordinary bus from Tan-awan, Oslob going to Bato first (fare:P20,) and then transferred to another Ceres bus that would pass by the town of Badian. 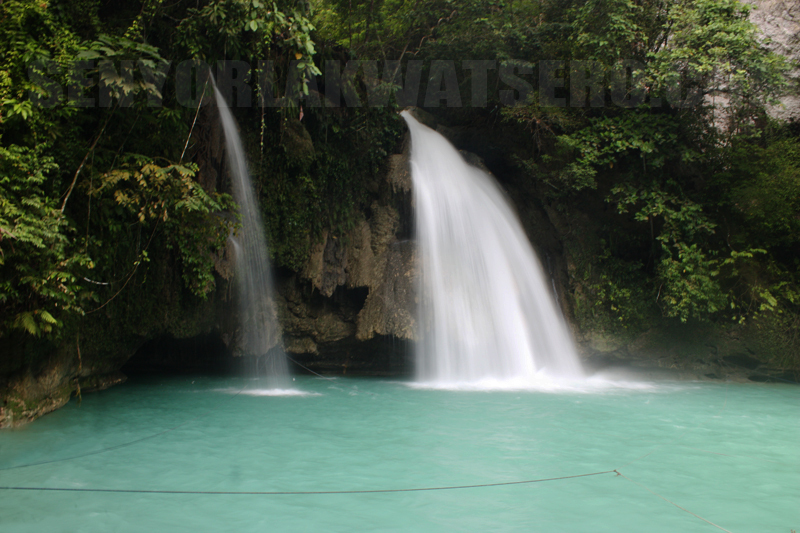 The bus dropped as off at barangay Matutinao, Badian, just in front of the big Kawasan Falls signage. 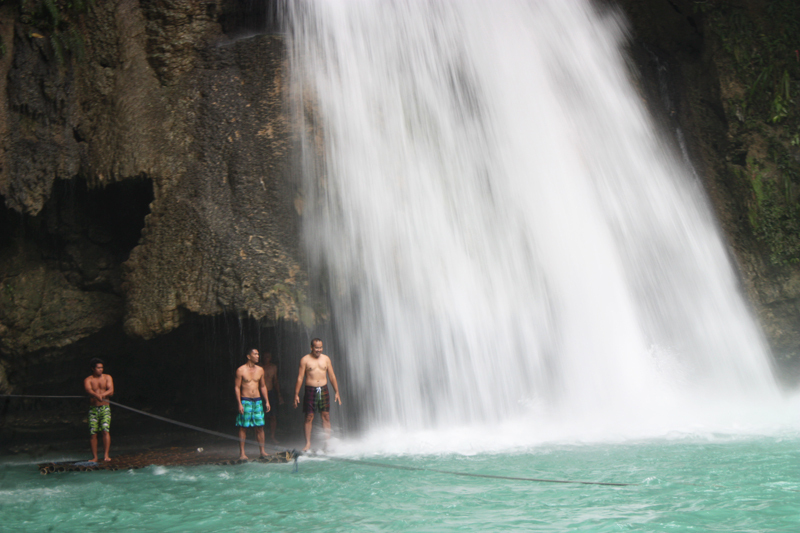 We were immediately approached by men offering to guide us to the falls. 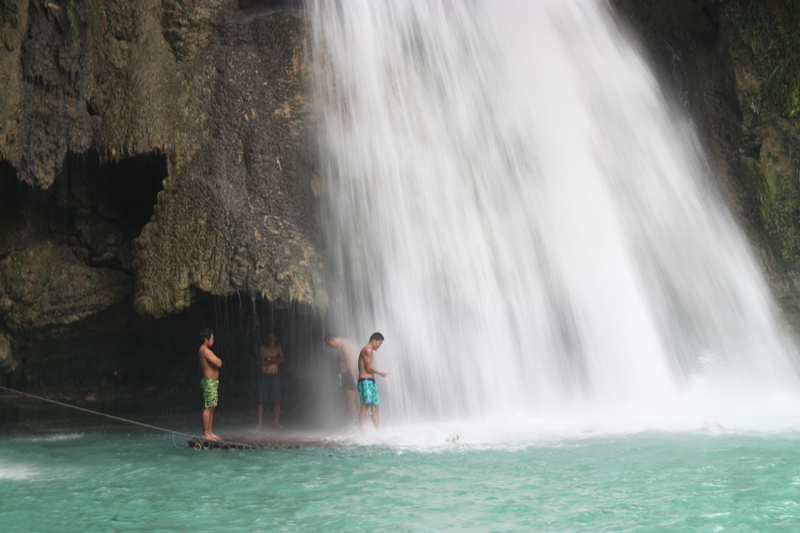 We knew beforehand, based on research, that it’s just a short easy walk to the foot of the falls so we ignored them and started walking, following the small road leading to the most popular spot in Badian. The vegetation surrounding the pathway provided a natural shade against the heat of the sun. The turquoise, cold and clean waters of the river on the left side of the road made me want to stop for a while and take a dip. We continued to follow the scenic route to the falls though, and in about 15 minutes we finally reached the spot; the first falls, that is, as there are two smaller falls on the upper side. We paid P10 each as entrance fees. The first falls is the biggest though and where a picnic area is located. There is a resort restaurant on one side of the waterfall. Tables and chairs are available for rent for P300. At 9:00AM, we were the only tourists at that time. 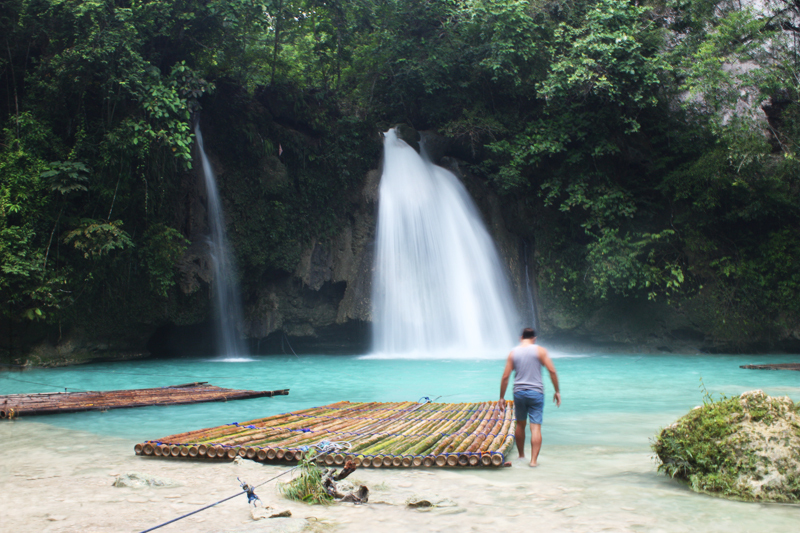 A man approached us and suggested that we rent the bamboo raft for P300 to take us to the waterfall itself for a refreshing shower and natural back massage. Sounds great! 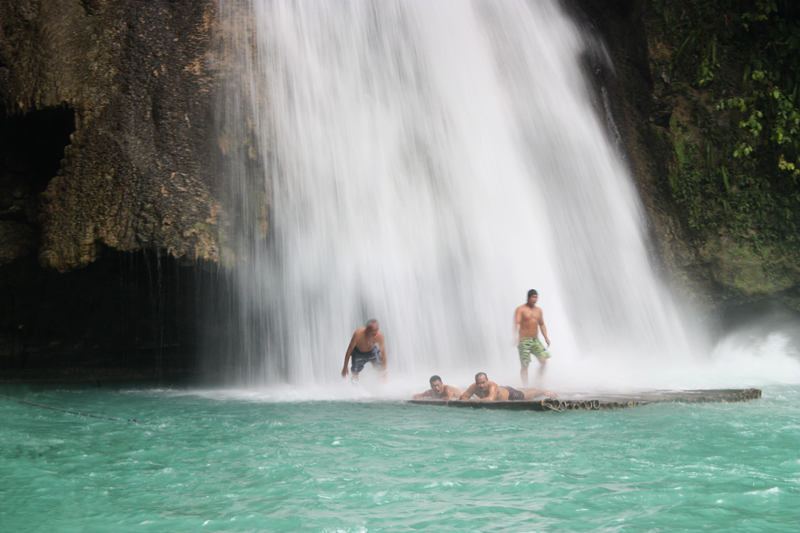 But as soon as we said yes, he added that we pay additional P250 each for two men who would pull the ropes to bring the raft to the falls. Annoying! We backed out immediately. Too much! An obvious ripoff attempt! There’s no way we’re going to pay them P250 each considering that we only intended to stay there for an hour or two. Besides,it’s not too hard to pull the ropes and maneuver the bamboo raft. He and the other two men started lowering the price until they agreed to P50.00 each. I hopped on the raft still feeling a little irritated. That however began to fade away as we got nearer to the falls and felt it’s strong gush of water. 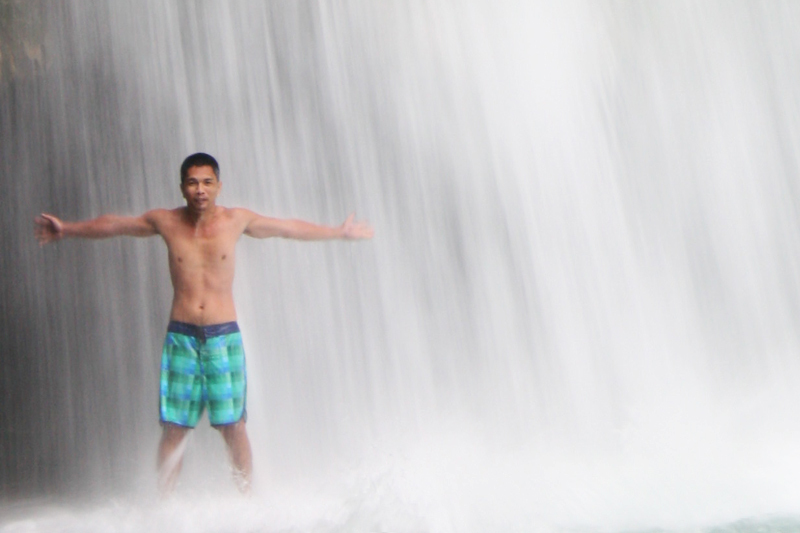 And as soon as we were under the falls, whatever negative feelings that’s left in me disappeared in an instant, and I automatically started shouting with glee! 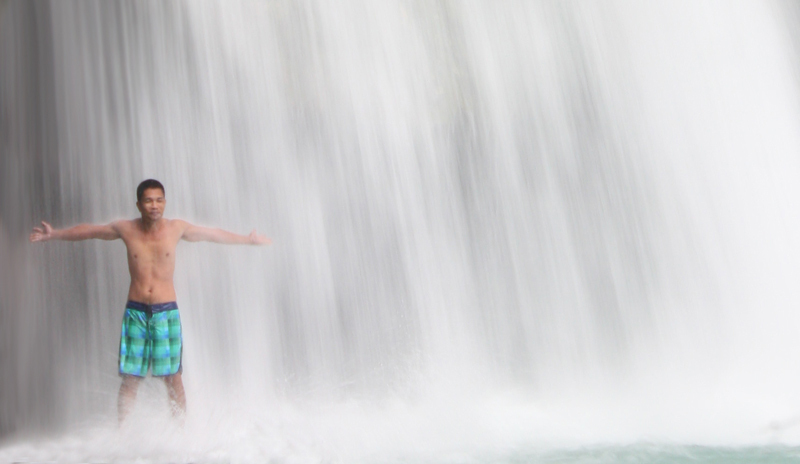 The feeling, as the waters massaged my head, back, shoulders, and literally, my entire body, was heavenly! 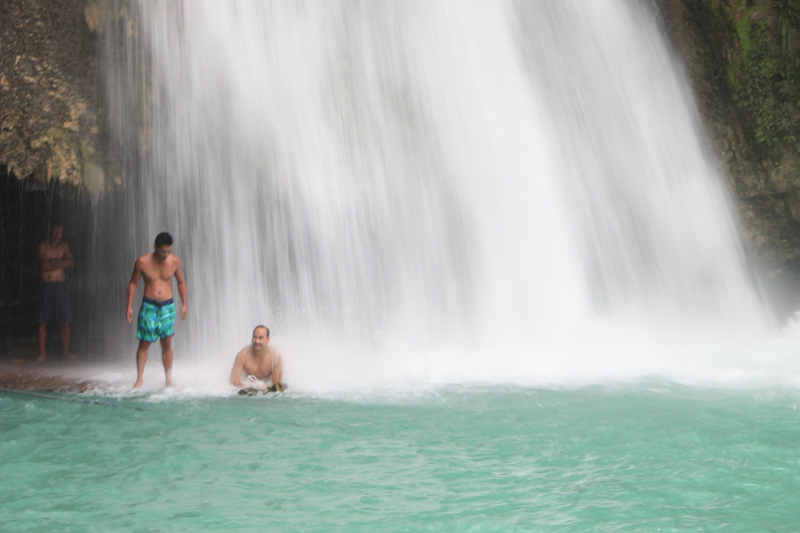 The guides showed us the different ways to position ourselves under the water so we could fully enjoy the falls. We were told to lie flat on our stomach, and then asked to clasp our hands together interlocking our fingers, then put our chin on top of our hands. This will serve as a cushion for the head and would protect the face from hitting the bamboo raft. 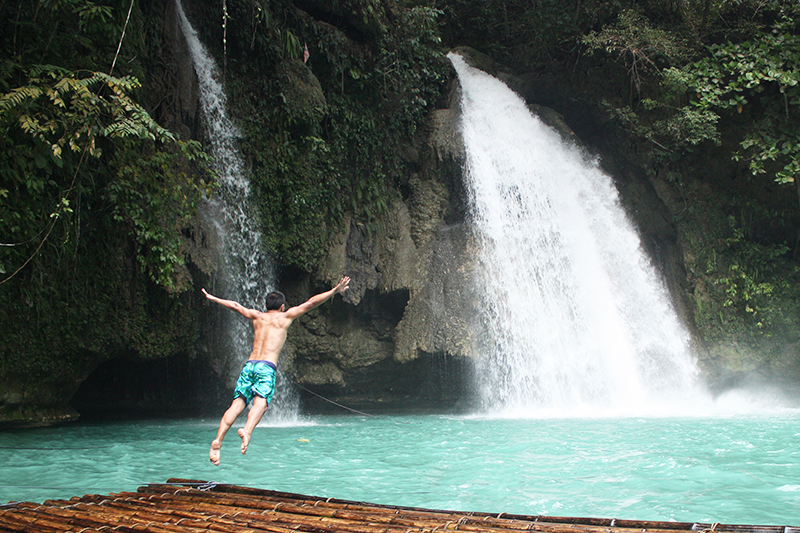 When we’re ready, they started pulling the ropes so the bamboo raft would pass through the center of the waterfall. The water was flowing down so strong, especially on the head, that I had to really keep it steady on its position or else, my mouth would hit the bamboo raft and this experience would end with my front teeth broken. I don’t recommend this. Matter of fact, my lips and my mouth hurt a little when we’re done. Our guide asked if we wanted to go back and do it once again. We declined. 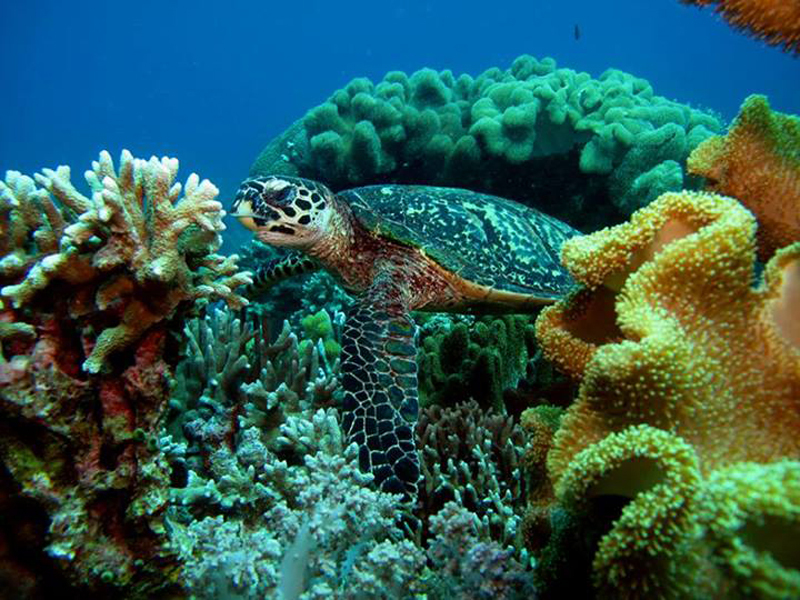 Besides, I’ve been wanting to swim and dive into its clean, greenish blue water since I arrived. 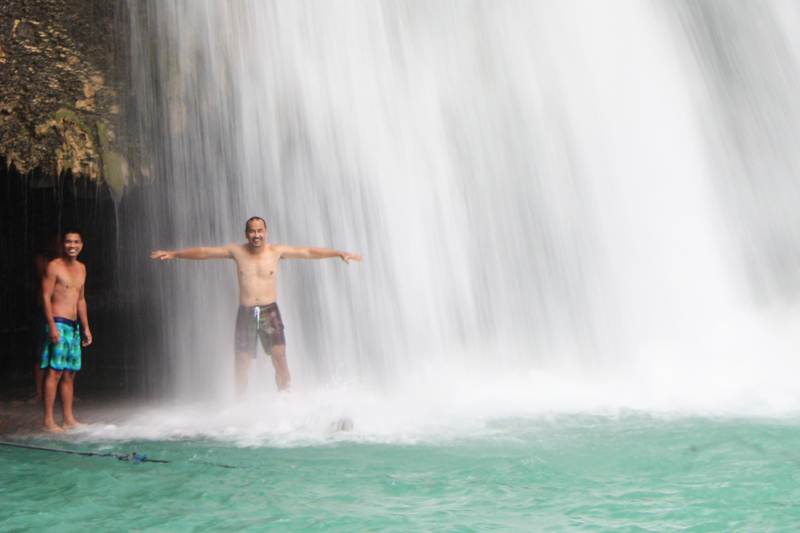 It was refreshingly cold and I was enjoying every minute in the water. 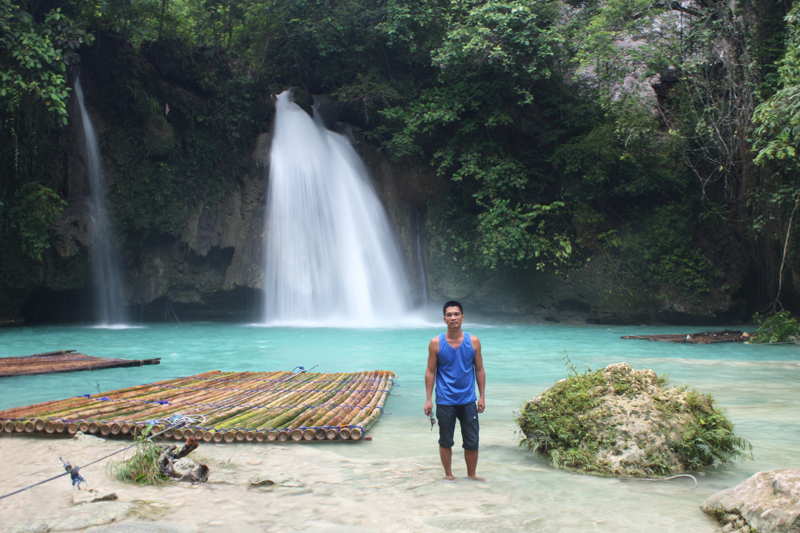 Kawasan falls may not be the tallest, or the grandest waterfall I’ve seen but my visit to Badian’s most popular natural attraction was simply the most amazing waterfall experience I’ve had so far. 1. 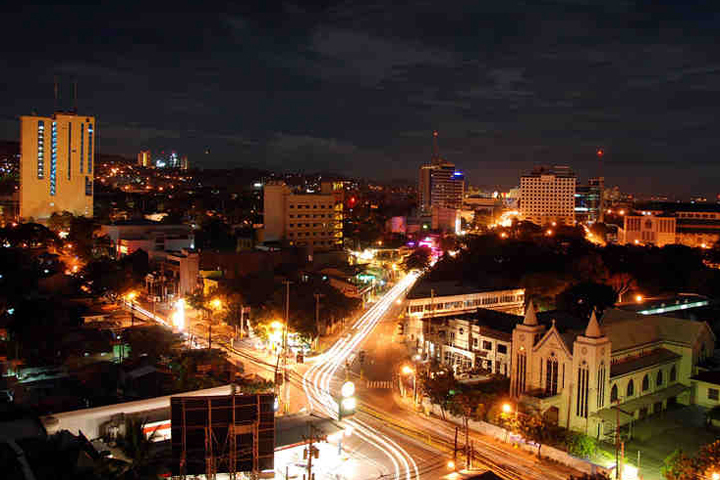 Ride a cab ( about P80.00) or a jeepney (P7:50) to Cebu South Bus Terminal (CSBT). 2. Ride a CERES, LIBRANDO or ROUGH RIDER BUS. Travel time: Approximately 2 to 2.5 hours. Fare: P120.00. 3. Tell the driver or bus conductor to drop you off infront of Matutinao church. Facing the church on your right side, you will see the Kawasan falls’ signage where you could find the road leading to the falls. It’s a short and easy 15-20 minute walk to the first falls. Tip. 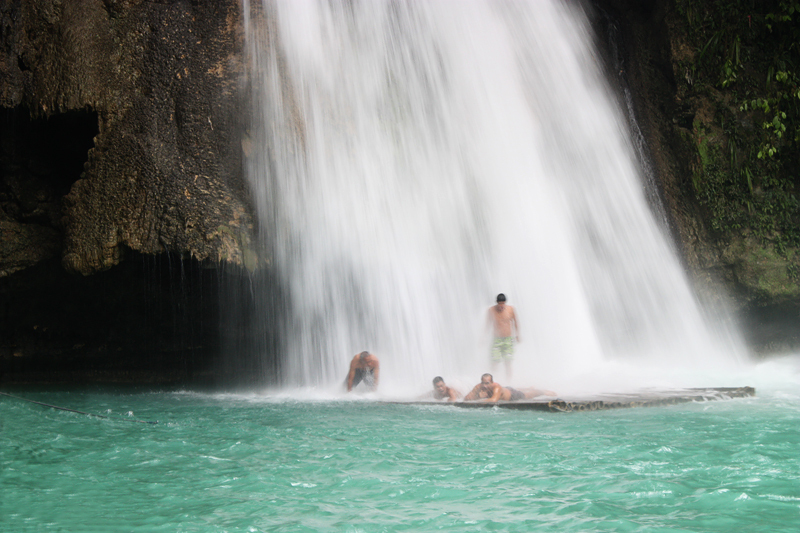 You don’t need a guide to get to the first falls, which is referred to the as the picnic site, If you’re into more adventures and intend to see all three waterfalls, then you may need the services of the guides. 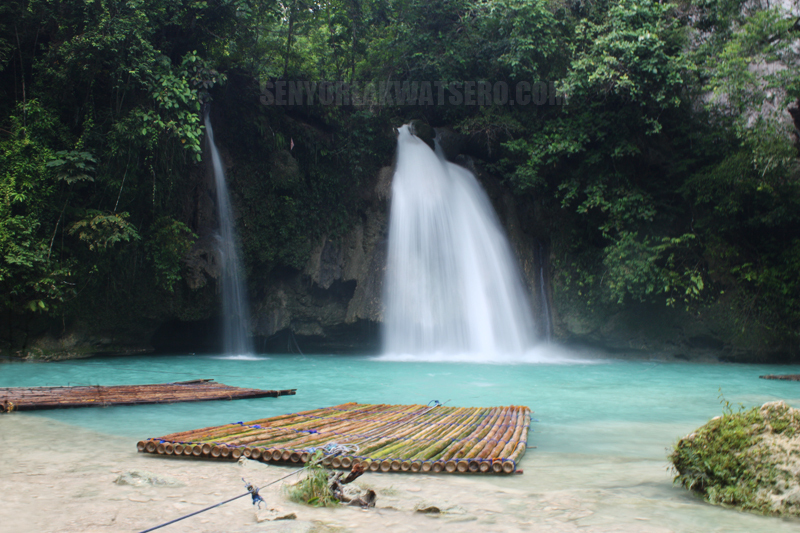 You just need to be careful when negotiating with them though as I’ve read a lot of scam stories from those who have visited Kawasan falls. 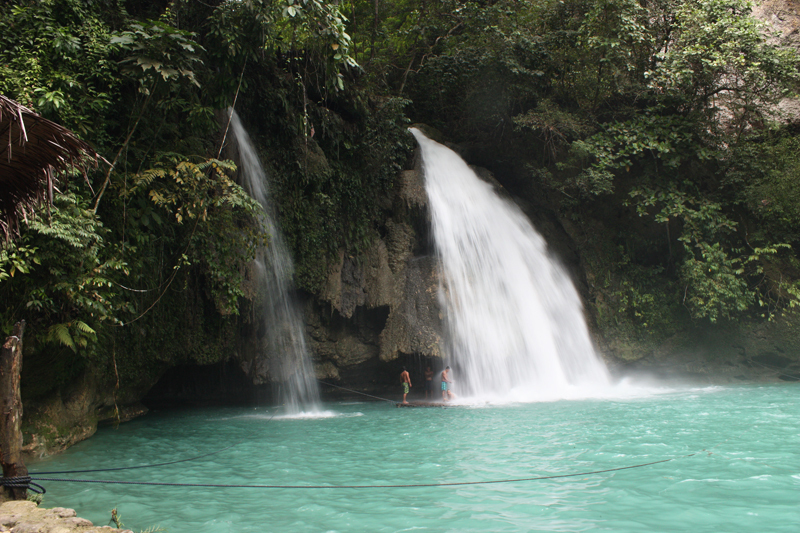 (Another tip: When haggling, we always base the price on the daily minimum wage in most of the provinces in the Philippines which is around P250-300, and the difficulty of the task) It will take about 2 hours to get to “the source,” or the top of the river/falls. 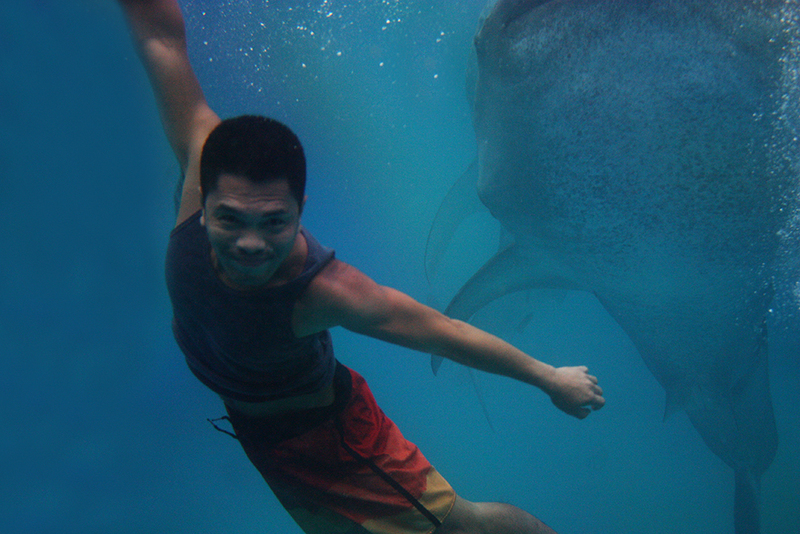 Hi, we are planning to come in Kawasan for a Day stay for Canyoneering. May I know where did you leave your things and take showers after the activity? Pictures look very nice, and place looks cool and wonderful. 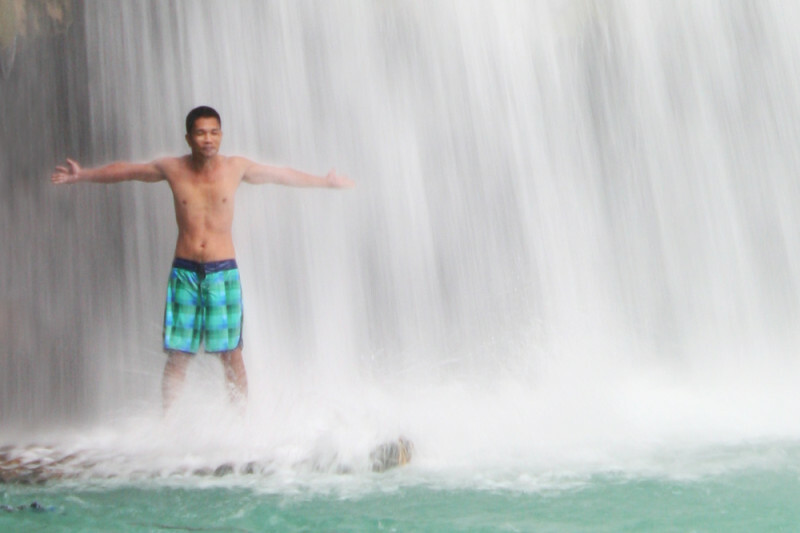 Cebu has really so many great waterfalls to offer. Every tourist must try and see it. To add more spice in your adventure, you can rent a motorbike or scooter at book2wheel.com .